Prime Minister Ahmet Davutoğlu on Thursday harshly criticized the chairman of the Nationalist Movement Party (MHP) for his uncompromising stance since the June 7 general elections, while he thanked MHP deputy Tuğrul Türkeş for accepting his offer to take part in the caretaker cabinet. 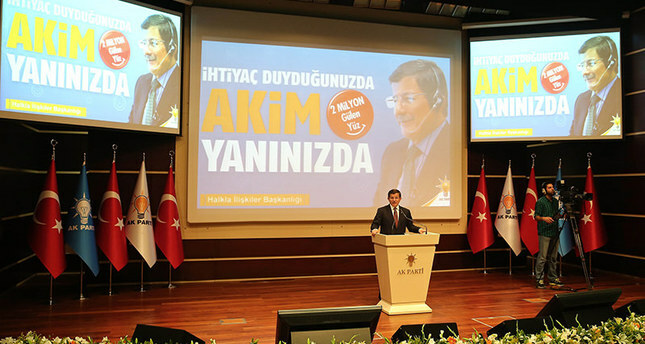 Speaking at his party's communication center award ceremony, the Turkish prime minister stated that the AK Party has been trying to find common ground with all political parties since the elections, but all of them –particularly the MHP- shut the doors for compromise and unjustly blamed the AK Party for contradicting the constitution. "It was Bahçeli who closed every single door since June 7," Davutoğlu said while adding that the MHP chairman said no to all options and possibilities that were on the table to form a government. He criticized the opposition leaders for opposing early elections and said they were responsible as they were the ones who said no to all offers. Davutoğlu noted that he wanted to speak with opposition leaders once again after he received the mandate to form the caretaker government from President Erdoğan, but they told him not to call according to the PM. "My intention was to sit down with the chairmen of other parties and negotiate the caretaker cabinet with them at the Parliament," he said and added that, "The hearts and minds of opposition leaders were closed to dialogue." Davutoğlu thanked MHP deputy Tuğrul Türkeş for accepting the offer to take part in the caretaker cabinet and for taking responsibility in line with the constitution while displaying ethics suitable to a 'state man' despite all pressure. He criticized the MHP chairman once again for slamming Türkeş for accepting the offer and said that history will record those who avoided taking responsibility at critical times. Davutoğlu also touched upon the recent defamation campaign that is being carried out against President Erdoğan's daughter, Sümeyye Erdoğan, and criticized opposition parties for failing to stand up for women's rights. Recently, CHP deputy Mahmut Tanal submitted a parliamentary question to Interior Minister Sebahattin Öztürk, claiming that the president's daughter has allegedly received a marriage proposal from an ISIS-linked leader in Syria. Davutoğlu called on CHP chairman Kemal Kılıçdaroğlu to take action against the deputy, who he claimed insulted Sümeyye Erdoğan and all young ladies. Furthermore, he called on all party leaders to adopt a more moral political stance. He urged fellow politicians not to exploit the private lives of other political figures and carry out baseless defamation campaigns. "Political ethics necessitates having morals, be honest and be a remedy for the problems of the people," he said. While the MHP and CHP had previously announced that they will not participate in a caretaker government, MHP deputy Tuğrul Türkeş accepted the prime minister's offer on Wednesday. Türkeş, who is the son of the founder of MHP received intense pressure from his party to resign. The party stated that Türkeş would be expelled if he did not resign himself. The MHP has been under fire for its uncompromising attitude since the June 7 elections. The party's stance has created dissent within the MHP. Sinan Oğan, a former deputy was expelled from the party for saying that the party performed poorly in the June 7 elections and could fail to pass the 10 percent election threshold in the upcoming November 1 elections.